Kings Commercial & Kings Business are delighted to announce the launch of their new website. 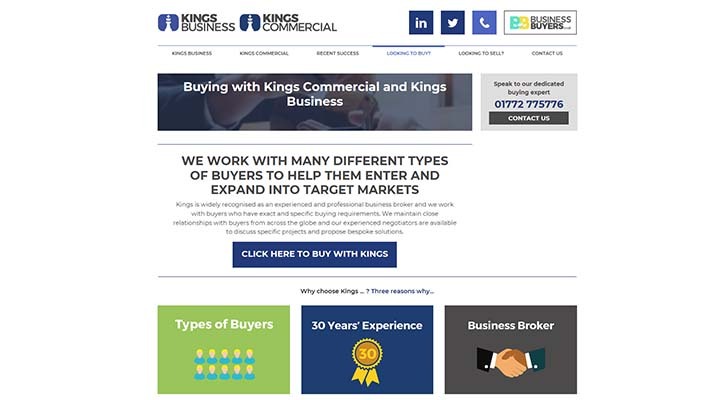 After decades at the forefront of the brokerage industry, Kings Business & Kings Commercial are delighted to announce the launch of their new specialist website, https://kingsbusiness.co.uk/. Helping those looking to sell their business with a profitable exit strategy, Kings Business & Kings Commercial endeavour to maximise the sale price of each sale they broker. The new website which is optimised for mobile compatibility, significantly assists with increasing the exposure for the opportunities which Kings sell. The online platforms will also afford Kings more control over the marketing of each business, allowing us to make every opportunity to be truly bespoke to each vendor and future business owner. Kings Business helps first time buyer with new business venture, in Stockport.